The Central Committee of the Communist Party of India (Marxist) expresses its deep condolences to the families of over 108 people who have died due to unprecedented floods that continue to ravage parts of Tamilnadu. Districts of Cuddalore, Thiruvalluvar, Kanyakumari and areas of Chennai city are severely inundated. The CPI(M) has decided that all its Members of Parliament shall donate a sum of Rs. 50 lakhs from their MPLADS funds for relief and rehabilitation of those who have suffered in the recent unprecedented floods in the state of Jammu & Kashmir. This is in accordance with the rules of the MPLADS that provide for such a prescribed amount of contribution by the MPs in an event of a national disaster. ..Thus a total of Rs. 10 crores will be contributed by the CPI(M) Members of Parliament towards relief and rehabilitation activities in the state of Jammu & Kashmir. The Polit Bureau conducted an in-depth review of the political-tactical line which the Party has been pursuing. A review report will be placed in the next Central Committee meeting. This is a preparatory step towards preparing the Draft Political Resolution for the Party Congress to be held next year. The CPI(M) has called upon all its units to immediately collect money to provide relief to the people of Jammu & Kashmir affected by the massive floods in the state. The Jammu & Kashmir State Committee of the Party has begun relief operations in the state. The Polit Bureau has asked state committees to collect money so that it can help in the relief work that is being undertaken by the Party in the state. Although the State Government and the army have moved in to provide rescue and relief operations much more needs to be done. Reports suggest that certain villages in south Kashmir are submerged. Rescue operations need to be conducted immediately to save precious lives. 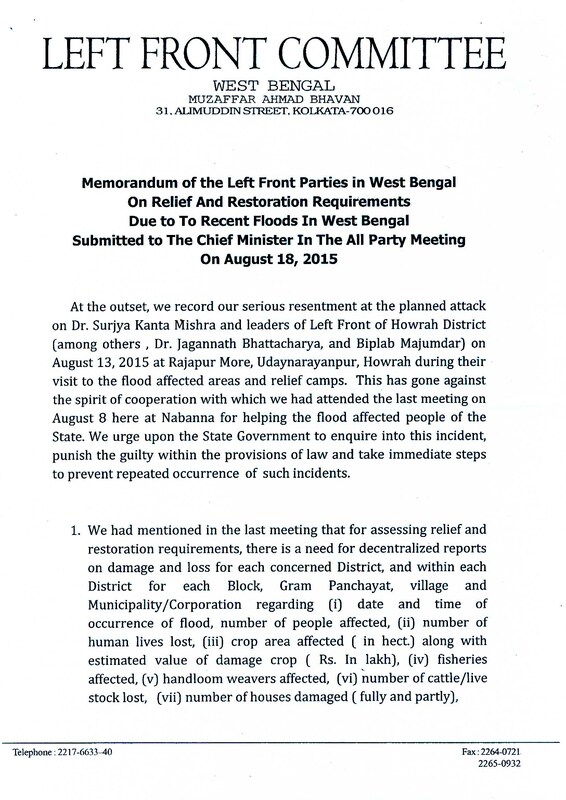 The Central Government must immediately rush relief to the affected areas. People have to be assured that full compensation for their losses will be given to them. The horror and immense tragedy of the loss of human lives and unprecedented destruction of homes and livelihoods in the Kedarnath, Chamoli and other regions of Uttarakhand is still unfolding. The numbers of those killed is rising every day. The urgency of immediate rescue and evacuation operations for the thousands who are stranded cannot be emphasized enough. The Central Government must extend its full support to the State Government including for funds and materials.